Fungi make up a huge part of the plant kingdom, but often we don’t even notice them. These fungi popped up in my garden a few years ago, probably digesting old tree roots or something similar. A fungus (/ˈfʌŋɡəs/; plural: fungi or funguses) is a member of a large group of eukaryotic organisms that includes microorganisms such as yeasts and molds (British English: moulds), as well as the more familiar mushrooms. These organisms are classified as a kingdom, Fungi, which is separate from plants, animals, protists and bacteria. One major difference is that fungal cells have cell walls that contain chitin, unlike the cell walls of plants and some protists, which contain cellulose, and unlike the cell walls of bacteria. These and other differences show that the fungi form a single group of related organisms, named the Eumycota (true fungi or Eumycetes), that share a common ancestor (is amonophyletic group). This fungal group is distinct from the structurally similar myxomycetes (slime molds) and oomycetes (water molds). The discipline of biology devoted to the study of fungi is known as mycology (from the Greekμύκης, mukēs, meaning “fungus”). Mycology has often been regarded as a branch of botany, even though it is a separate kingdom in biological taxonomy. 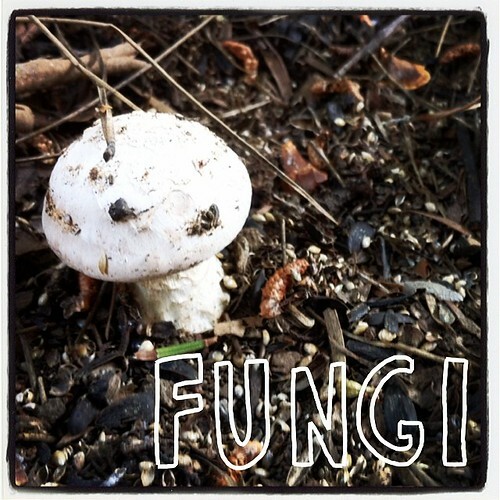 Genetic studies have shown that fungi are more closely related to animals than to plants.